The Indo Carry Bag is the perfect travel accessory to help transport and protect your Indo Board Balance Trainer. There is plenty of extra room for workout clothes, yoga mats, water bottles, or other favorite gear. 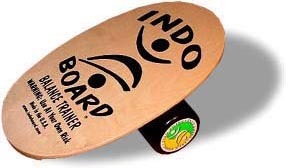 The 1/4 inch foam padding safely carries a complete Original Training Package (Original model deck, roller, and IndoFLO cushion) or the Mini Original Training Kit (Mini Original model deck, roller, and IndoFLO cushion).